The Brontosaurus is number one in our hearts and believed to be the original hipster (solely by us) because they were vegans before it was cool. They weren't eating a healthy mixture of leafy greens just to take a picture for 'likes' on social media. They weren't even doing it for health-related reasons; Brontosaurus ate leaves and grass because they felt like it and that's a hip idea. This costume is bound to reel in a ton of candy this Halloween so sticking to only eating salad isn't a costume requirement. Stir up commotion on your block by getting your neighborhood crew in on the prehistoric fun. We have a T-Rex inflatable costume (a Jurassic classic) as well as a Triceratops one just like it. Your neighborhood crew has now transformed into your dino-pals. We feel a stampede coming on! 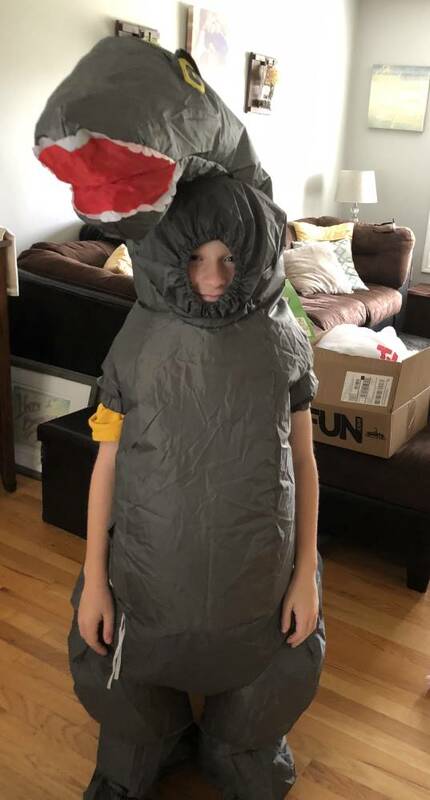 My 6 year old fit fine into the body of the costume, however the head hole was frightening to her. The top of the elastic would not stay up and it would cover her eyebrows, making it very uncomfortable and frightening for a blow up costume. 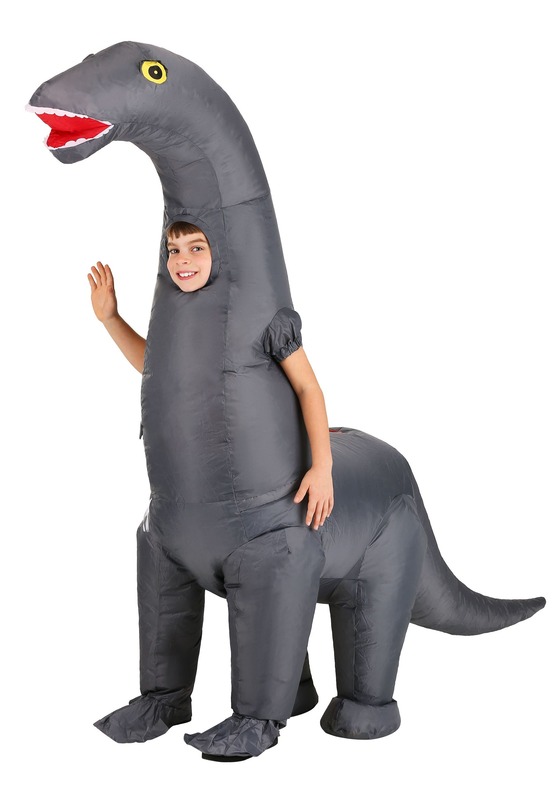 Bought this for my son for Christmas (he desperately wanted a long neck dinosaur costume). On Christmas morning, he tried to put it on. This was obviously a previously returned item, as the battery pack was filled with mixed types of dead batteries. Even with brand new batteries, the fan died within the first five minutes of trying to inflate. And, as the other reviewer mentioned, the head hole is way too small. My six year old was barely able to get his head through the hole. So far the exchange process isn't easy- I can't email, but have to call within fourteen days. Considering I bought this a bit early for Christmas and only opened it today, that doesn't exactly give me a lot of time to tell them what they already know- they sent me a used and defective product. I'm so sorry to hear that you received a defective product such as that! I assure you that we wouldn't knowingly send you something that doesn't work or isn't in the best possible condition, and we are always willing to help over email, or you can initiate an exchange on our returns page. The best option would be to reach out to Customer Service in a case like this!